RaMBa”M). Group of four Latin translations and studies. FIRST EDITIONS. * De Cultu Divino, ex… Secunda Lege, seu Manu Forti. Latin translation of Sepher Avodah Maimonides’ Mishneh Torah by Lewis de Compiegne de Veil. pp. 384. [Vinograd, Paris 83]. Paris, Guidonem Gaillou, 1678. * Tractatus Talmudicus De Festo Novi Anni…Itemque Maimonides de Synedriis & Poenis. Latin translation and commentary by Henrico Houting of Babylonian Talmud Tractate Rosh Hashanah, as well as Maimonides’ Laws of Sanhedrin and Punishments (Sanhedrin Ve’Onashim HaMesurim Lahem). pp. (4), 154, (2). 171, (3). [Vinograd, Amsterdam 633]. Amsterdam, Henricus & Viduas Theodore Boom, 1695. * Hilchoth Shevu’oth / Constitutiones de Jurejurando. 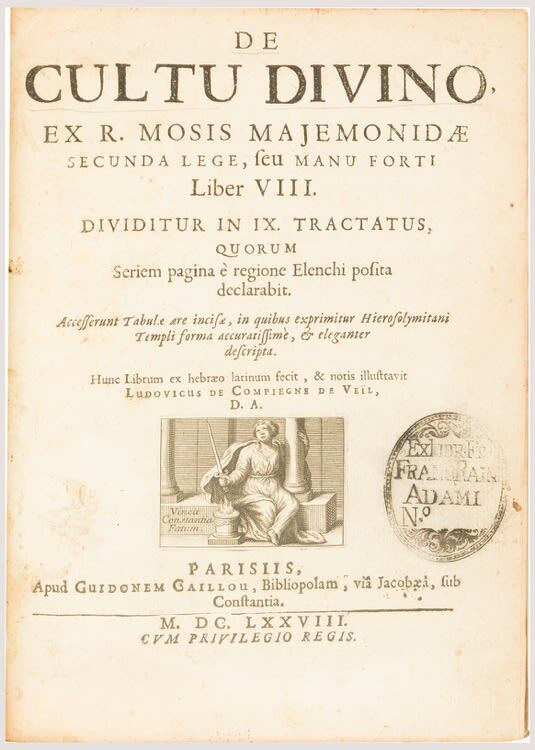 Latin translation and notes by Justus Christopher Dithmar. pp. 226. [Vinograd, Leiden 56]. Leiden, Cornelius Boutesteyn, 1706. * Hilchoth Ma’aseroth / Commentarius Philologicus de Decimis Judaeorum. Translated by Johannis Conrad Hottinger. pp. (20), 253, (11). [Vinograd, Leiden 58]. Leiden, Isaac Severin, 1713. Together, four volumes. Some light wear. Variously bound. Sm. 4to.